I had a free room at the South Point. Completely pointless, but I used it. Pretty nice room. Actually, they gave me a couple of coupon books with some free stuff, so it wasn't completely pointless. On the down side, Steak 'n Shake still isn't open. 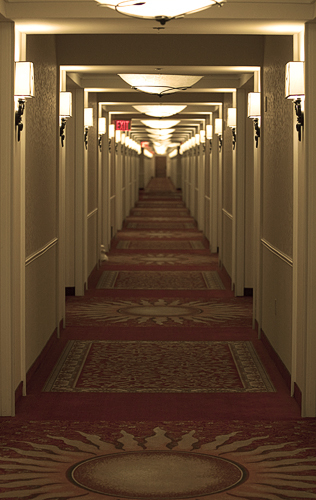 Incidentally, this corridor reminds me of Inception. Very Nice! So, this is the long hallway that you were talking about. Yep. I went all the way down to one end to take the photo.